The H-180 is the most recent development of our range in which we have incorporated all latest technology and know-how. 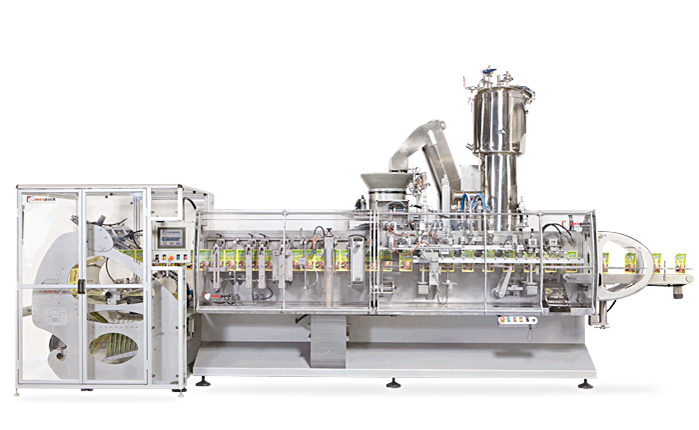 The H-180 is a medium size horizontal form –fill– seal machine which produces pouches from a reel of flexible material. Flexibility is the main aspect, as using the same machine it is possible to make a wide range of different pack presentations with maximum efficientcy and keeping high seal integrity. 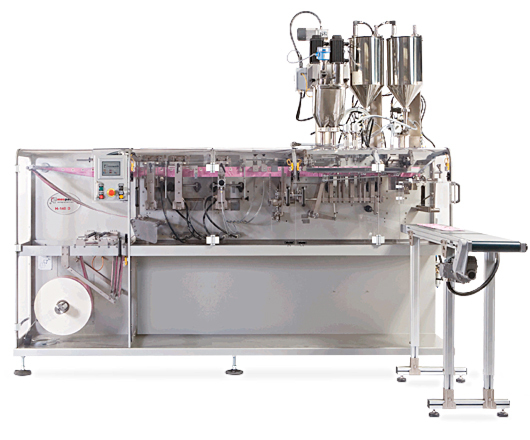 Change over simplicity and rapidity from one product to another or from size to size, makes Mespack machines unique with respect to any existing competitive machine. Maximum volume 1000 c.c. 50 c.c. 2000 c.c. 500 c.c. Technology used incorporates both, simplicity and heavy duty construction, to enable maximum efficiency and minimum downtime. Flexibility is another main aspect, as using thesame machine itis possible to make a wide range of different pack presentations. Change over simplicity and rapidity fromone productto another or from size to size, makes Mespackmachines uniquewith respect to any existing competitive machine. Maximum volume 2000 c.c. 750 c.c. 3000 c.c. 1000 c.c. 750 c.c. 250 c.c. 200 c.c. 100 c.c. Reduced in size it allows to fill up to three different components into the same sachet. Ideal for soup products where medium capacity is needed (up to 100 sachets/minute) and it’s very reasonably priced. Low maintenance and change over simplicity are a plus in this model. Full range of filling heads combinations feasable. Manufacturer of Horizontal Form-Fill-Seal baggers for products such as Solid, liquid, powder, granules. Enabling you to present your product in a most innovative shape and using latest techniques.